In a city of millions, it isn’t right but it’s easy to turn a blind eye to the suffering of others. Lost in an ocean of lives lived from 9 to 5, spent peering into mobile phone screens, behind closed doors or simply through a blinkered field of vision, a lot goes unseen, unnoticed and unresolved. It’s in this world – and more specifically a Tottenham housing estate – that writer-director Sean Spencer sets Panic, his impressive debut feature. A very human crime drama that tackles the brutality of people smuggling and champions the plight of those powerless to escape its grip, Spencer’s film further resonates within the claustrophobic psychological confines of its protagonist’s mind and body. Physically and emotionally blighted by anxiety, music journalist Andrew Deeley (David Gyasi) conducts interviews with artists from the safety of his front room, high up in a block of flats. Spencer, with a keen eye for mise-en-scene, shows Deeley’s wall of LPs but blurred on one shelf sits a bottle of pills. Both are remedies for his condition: one for the soul, the other the crippling symptoms, and although his profession does not play directly into the plot, the events of a previous gig is vital to understanding his character’s state of mind. Between, and sometimes during, these calls he looks through binoculars at residents of the opposite tower; one girl in particular catches his eye. Though such voyeurism would be frowned upon in most cases (unless you’re Jimmy Stewart in Rear Window), there doesn’t appear to be anything sinister or depraved to Heeley’s snooping. Rather it’s simply a desire to take interest in the life of another, imagine who they are, what they do, even come to care for them. A momentary flash of eye contact between these distant neighbours, a phone call with an ex, the mention of something awful that happened eight months previously by never seen but frequently heard and increasingly exasperated editor, Pete (Cristian Solimeno), generate questions. But Deeley isn’t able to talk about it, and neither is anyone at the other end of the telephone. In an early musical interview segment, mention is made of creating a “sonic landscape” and the film’s reverberating score – from London-based composer Christopher Bangs – builds to a crushing head when Deeley attempts to leave his flat. 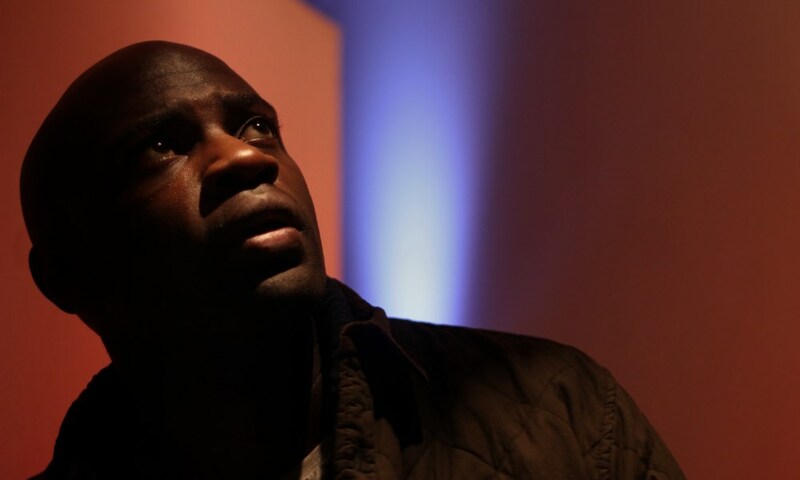 Gyasi is formidable in the leading role. The Hammersmith native, whose previous film work includes Interstellar and Cloud Atlas, plays Deeley with downcast eyes and an almost vacant, hounded stare, coupled with the uncontrollable physical symptoms that such attacks induce. He is a man who has lost faith in himself, a sense of direction, afraid of the outside world. An internet-arranged hook up with Michelle (Pippa Nixon) is the first intrusion into his personal space, but the witnessing of a crime and his concurrent urge to do the right thing provides a way out, however dangerous it may prove to be. Driven, given a purpose, Deeley is able to break barriers, free chains that have paralysed him in order that he may help another in need of doing the same. Panic takes its central character to places he does not want to go but in doing allows him liberation, prompting a viewer to reflect on the importance of caring for ourselves and those around us.